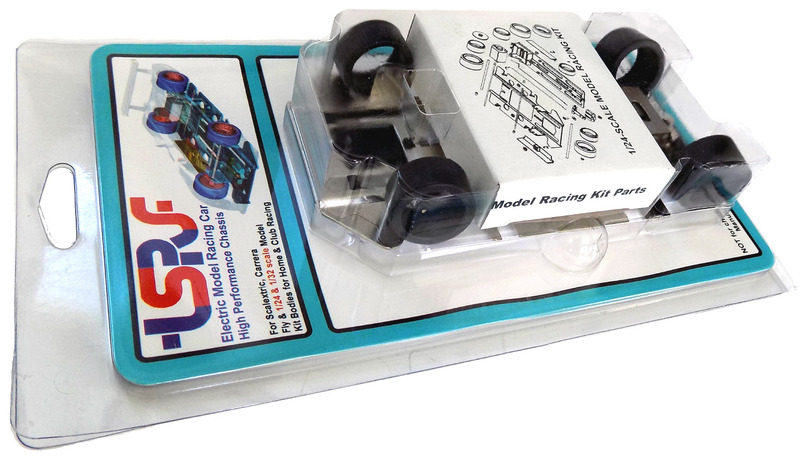 T24004HPS - 1/24 Scale Chassis Kit (For plastic track) [T24004HPS] - $65.95 : TSR Slot Cars, TSR Slot Cars - Dedicated to Slot Car racing, collecting, restoration, track design, electronics and software. Club-Racing chassis kit with Urethane-compound tires. The T24004HPS is supplied with TSR urethane compound tires to be slipped over setscrew machined aluminum wheels, for use on plastic tracks or routed wood tracks where no traction compound is being used. One traction magnet is supplied. The motor is fastened with two stainless steel metric screws. Supplied with TSC25 guide pin for Carrera, Revell, Monogram tracks. For use on Ninco track, TSR recommends that up to two traction magnets be used and covered with black electrical tape, and the guide pin must be shortened and narrowed with a Dremel disk or use part # TSC25N. Supplied with pin-style body mounts as well as model kit body side mounts and hardware.